in70mm.com staff taking a closer look at the iconic Parisian cinema La Géode during the September 1987 "Closed on Tuesdays" 7OMM IMAX mission to Paris. The famous French OMNIMAX theatre La Géode (La Villette) in Paris will be closed for rebuilding on November 30, 2018 after more than 33 years of operation. The last 7OMM IMAX show will be the 6.30 p.m. performance of "America’s Musical Journey". La Géode opened in May 1985 and was the first OMNIMAX theatre in France. It ran successfully IMAX/OMNIMAX programs, but was less and less attractive – since 2016 audience was under 300.000 patrons/year. At the beginning in the seventies it was the location of the new slaughterhouse named Abattoirs de La Villette. It was never used, however! Then President Giscard d’Estaing decided to transform all the buildings into "La Cité des Sciences et de l’Industrie" with a futuristic dome theatre. Some enthusiasts thought that the French system Panrama by Philipe JAULMES would be used, but they were disappointed! Panrama had two main defects: insufficient light and sharpness missing. The management of the new La Géode instead opted for the new Canadian IMAX/OMNIMAX system. The theatre was designed by architects Adrien FAINSILBER and Gerard CHAMAYOU. A concrete and stainless steel sphere of 36 meters in diameter. Indoor a dome theatre with a 1,000 sq. meters hemispheric screen and 370 seats. 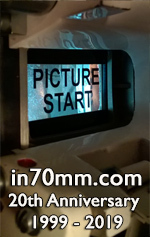 The projection room was equipped with an IMAX 15 perf./horizontal projector and a Philips DP75 70/35mm projector for ads and additional shows. Professional slides projectors were used for slides show at the beginning of each performance. A big and impressive show synchronised with the DP75 and the IMAX. projector. 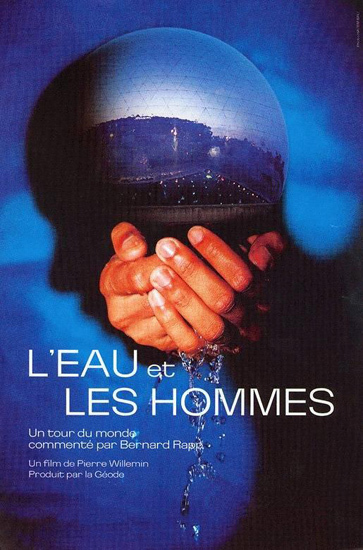 It was inaugurated with the "L’Eau et les Hommes" (Water and Men), the first French OMNIMAX film – This production was often re-released with French "Hydro", a short for Electricité de France, the French National Electricity supplier. At the time of design and contruction La Géode was the most expensive cinema yet in France. In December 1987 ticket price was 40.00 FRF or € 6.10. Remember that in the sixties the most expensive cinema in France was EMPIRE-CINERAMA 12.50 FRF or € 1.90 at the mezzanine for night performance! My first ticket in this theatre - Friday 11 December 1987. In my personal opinion the most successful screenings were "Grand Canyon", "Dream is alive" and "Everest". 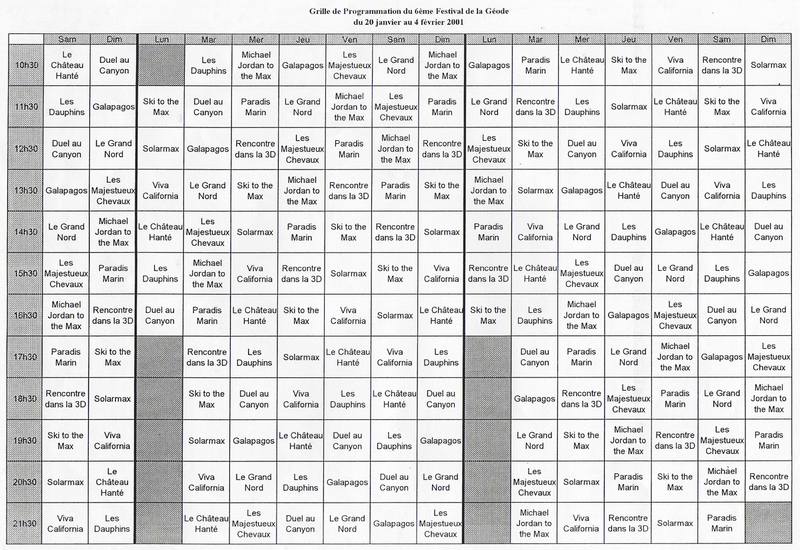 Some years La Géode organized OMNIMAX Film Festivals with various titles. The construction of the never used slaughterhouse and La Géode were at the origin of a financial/political dispute, due to the costs and what was considered as "waste of public money". 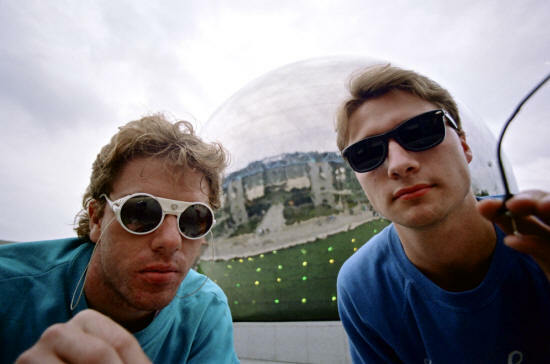 At the same time management went through some changes, and the company shot a second version of "Water and Men" – the first version was too bad to be screened! One of the projectionists of LA GÉODE was the well know projectionist Bruno DJARDALI, from the former KINOPANORAMA. Now this theatre will be managed and programmed by Les Cinémas Pathé Gaumont and will be reopened at the end of 2020 after main improvement and refurbishment works. The detail of these works is secret – for the moment – Wait & see! Les Cinémas Pathé Gaumont and the Cité des Sciences et de l'Industrie have announced that La Géode will be closed beginning Friday 30 November 2018 for renovation. When it reopens to the public in 2020, La Géode will offer a fantastic new and original experience at the crossroads of arts and innovation. Inaugurated 32 years ago, the Géode is located in the Parc de La Villette complex (Paris 19th arrondissement), on the south esplanade of the Cité des Sciences et de l'Industrie. The theater gives audiences the unique opportunity to watch documentary films on one of the largest hemispherical screens in the world. On 9 January 2018, following a call for innovative projects, Universcience (the public establishment for the Palais de la Découverte and the Cité des Sciences et de l'Industrie) granted the management of this iconic Parisian cinema to Les Cinémas Pathé Gaumont. Les Cinémas Pathé Gaumont are leaders of exhibition theatres in France, the Netherlands and Switzerland. They are also present in Belgium. At the end of 2017, Les Cinémas Pathé Gaumont operated 111 movie theatres, totaling 1,091 screens, 66,2 million admissions and 760 million euros in revenue. Les Cinémas Pathé Gaumont strategy of upgrading and modernizing is based on an active policy of creation, reconstruction, and renovation, constant innovation with the latest technologies, new and adapted services and an optimized viewer experience, at the cinema and online. Les Cinemas Pathé Gaumont is owned by Pathé, one of the biggest film producers in Europe and a major player in film distribution.